The Original Smart Treat - Total Oral Solution. 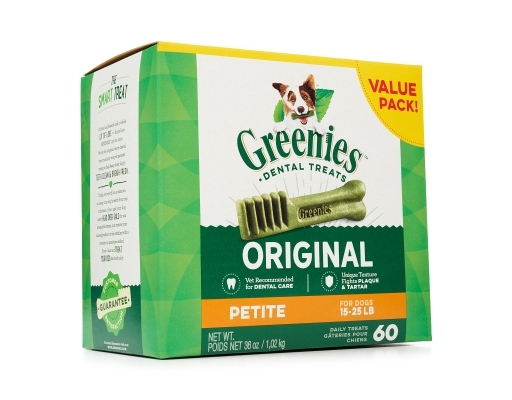 Greenies Dental Chews are the #1 veterinarian-recommended dental chews and clinically proven to provide a total oral health solution. 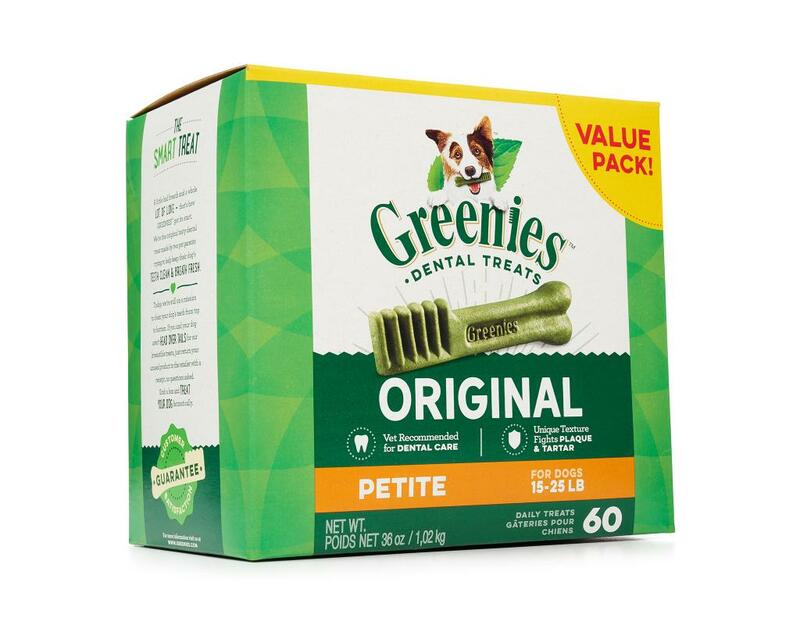 NUTRITIOUS INGREDIENTS - Greenies Dental Chews are nutritionally complete and balanced with added vitamins and minerals to provide complete oral care, and offer a healthy blend of highly soluble ingredients and digestible proteins for adult dogs. 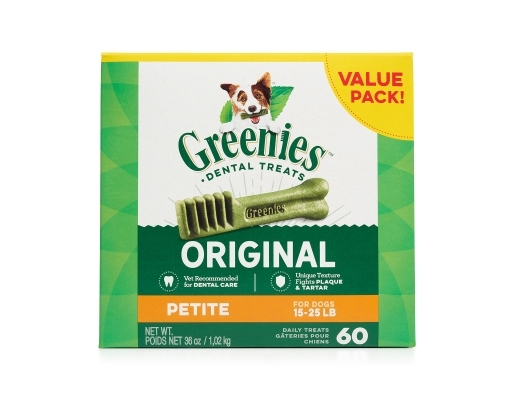 UNBEATABLE TASTE - NOTICEABLE DIFFERENCE - Greenies Dental Chews are clinically proven to clean dogs’ teeth by fighting both plaque and tartar buildup, freshening breath, and maintaining healthier teeth and gums. 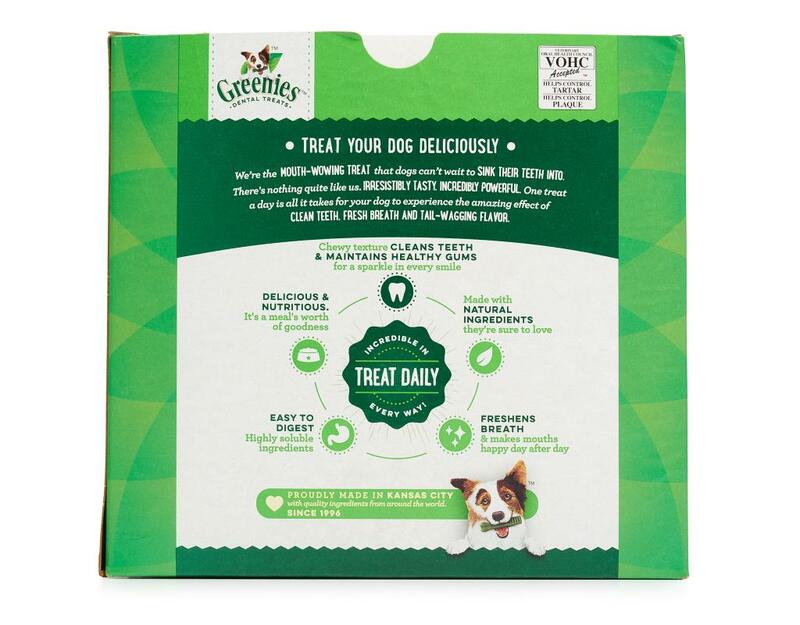 3 out of 4 dogs show signs of oral health issues by the age of 3. Complete oral care is important for your dog’s total body health. 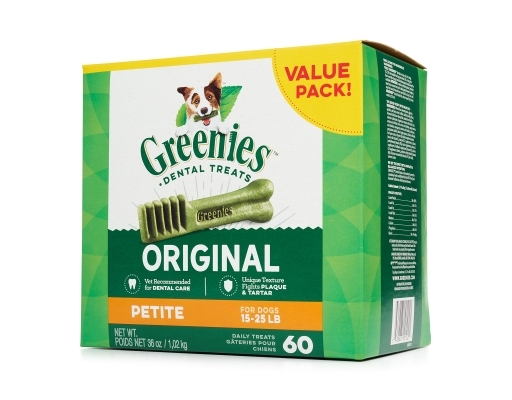 Good oral hygiene can add years to a pet’s lifespan. 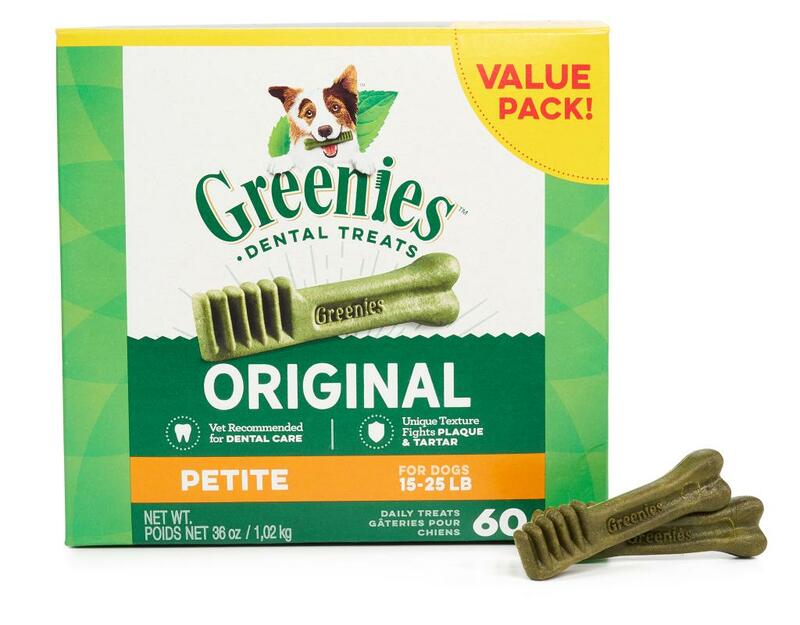 A CHEWY TEXTURE - One Dental Chew a day helps clean your dog’s teeth by using his natural chewing action to wipe away plaque and tartar buildup from the surface of the teeth. The chewy and flexible texture allows teeth to sink in with every bite all the way to the gums for more effective cleaning. And Dental Chews have The Veterinary Oral Health Council (VOHC) Seal of Acceptance for plaque and tartar control. 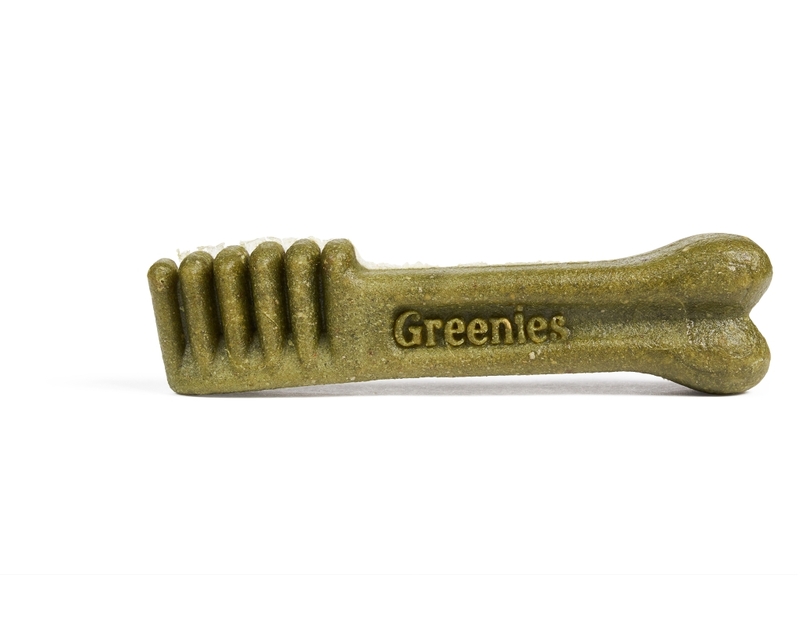 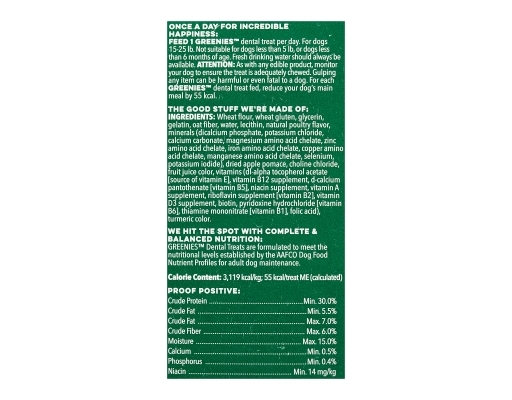 EASY TO DIGEST - The highly soluble ingredients in Greenies Dental Chews help the product to break down quickly for easy digestion, making them more digestible than premium dry dog food. PLAQUE & TARTAR FIGHTING NEVER TASTED SO GOOD - Dogs love the taste and independent testing confirms Greenies Dental Chews are highly palatable and great tasting.